4:49:58, 4th in the men’s open, 8th Overall. It was hot at the start (73 degrees) and at the end (85 degrees). There were hills – lots of them; more than I remembered. The down-hills were quadbusters…. The day started early, about 4:30 and uneventful. My brother, wife, and kids were planning on coming out for the end of the race and so I was on my own for race day morning. As I drove out to the race, I ate my pre-race meal of a cliff bar, banana, and about 30 oz of high quality H2O. I arrived at the race site around 5:30, about an hour before the race. I seem to get a little anxious before big races, and this was no exception. The check in process went smooth – no lines that early in the morning. On the way back from check-in, I met John and Beth in the parking lot, and it helped ease my pre race jitters. They were on their way to check in and I told them I would meet them back at the car. I had some last minute race preparations. I double checked my “fuel” within my Race Ready Shorts which has enough pockets to hold 2 small pill bottles filled with HEED, 3 GUs, and 4 S Caps without any problems. 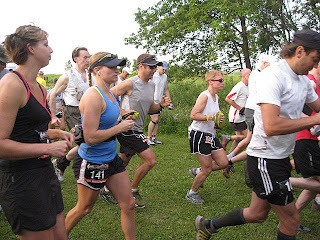 After my pre-race GU, I found Beth and John and we headed over to the start line. The warm morning started off as usual at this ultra. It was low key, a small gathering of around 150 runners. There was a minor agenda prior to the race – an award to the ATR for over $25,000 in donations over the 17 year history of the race. With a couple of announcements such as “Keep the flags at your left – there are many trails, but only ONE course!” and “Run as hard as you can for as long as you can!” and the traditional – “Go!” we were off. The first five miles of the race were much hillier than I recall from previous races. It was hard to get into a good rhythm, as I would run solid about ¾ of mile at a sub 8 minute pace, only to go straight uphill the last ¼ mile making my splits around 8:30 for the first part. No one really caught my attention besides one guy who could really run downhill. He passed me on every down hill for the first 4 miles; the problem was he was going way to slow on the flats and up hills. I thought to myself that that guys quads were going to be a mess at the end of the race. As I was running the first five miles, the thought about how tough this race really settled in. I could not find a solid pace to stick with; it was terribly warm already and without doubt was going to get warmer. From the start, I thought there were around 20 people in front of me. The people that were running around me started tor drop, but I never really could tell how many people were in front of me. It annoyed me to not know where I was in the field, but I thought I was probably where I was at least year’s race – just at or right inside the top twenty. At that point, I decided I just needed to forget about the people in front of me and just run my race. About mile 6, I started to feel better. I stuck to my nutrition plan, having a GU every 40-45 minutes, refilling my water bottle with my HEED mix every hour – topping off with water every chance I had to get the 24-30 oz of water/heed mix per hour. I was beginning to feel more in the groove – I still believe the toughest five miles out on that course are the first five (and then again from miles 16-21). About 7 miles into the race and after a long decent, you hit one of, what I call, the big 3 hills. Although this hill is a long gravel road, it must be about a half mile long in total with a slight “runable” incline in the middle of the hill. This hill just seems to torment me each year, just knowing that it is the first of three hills I detest, and then knowing that I was going to have to climb it again in the 2 loop course. I soon found myself basically alone through most of the last half of the first loop. 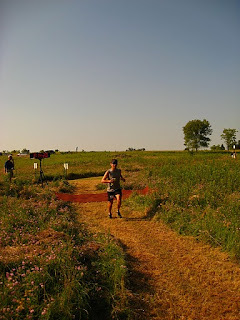 The course led to another open prairie section at that time, I counted about 8 people in front of me. I wasn’t going to catch them, and figured there were quite a few more people in front of them. Nothing else too much happened the miles clicked on by. The second and third “bad” hills came and went. I pulled into the halfway point at 2:14:20. I was on target, but with the warmer weather, I knew I was going to have to slow down a bit so I wouldn’t risk heat exhaustion. I decided I would shoot for 4:45, just a bit faster than last year. I started out on the second loop after restocking and fueling up once again. This time around, I grabbed my Ziploc bag that was filled with 3 more GUs, cliff bar, 2 pill containers of HEED, and a few more S –Caps. I refilled my HEED, ate ½ the cliff bar, and had my 4th GU of the day at the half-way point. I ran through the terrible first 5 miles of the course basically solo. I came out of the wooded area to a prairie and noticed I had 2 people I could catch about quarter mile ahead of me. I focused on them and caught them on an incline that I ran and they decided to walk. One guy in my age group and one woman; I passed both with a runner’s “Keep it up”. They were both struggling. As soon I passed them, I had another guy, in my age group, pass me from out of nowhere. He went pretty fast by me, but then slowed, sped up, slowed and eventuality we were passing one another every quarter mile or so. We hit that first hill again, and we walked up together. I found out his name was Rob, and this was a training run for a 50 mile event in the fall. He wanted to make it through the 31 mile race and feel pretty good. He started with a buddy, who was struggling during the first loop. Finally, he decided to drop his buddy at about mile 13 and he had picked up his pace. We chatted for bit, and were running together for about a two mile period. We hit a flat space and we both ran well. He was a bit in front of me at that point, but we came to an aid station and I passed him as he walked in. I was quick through the aid station and did not see Rob again, but I was just sure he was going to catch me all the way up until the finish line. With about 6 miles to go in the race I came upon an aid station. I first spotted my wife’s beautiful smile, then my boys bopping around, and my brother, all looking in a different direction down a different section of the trail (this was a two sided aid station). It was great to see them, and finally I was with reach and had enough energy to yell at them. I came in and had my water bottle topped off again, and gave the boys high fives. My wife and brother both said that I was doing really well, and both said that I was likely in the top ten. What?? Top Ten?? No way. My time was similar to last year at this point, and last year I came in 19th. 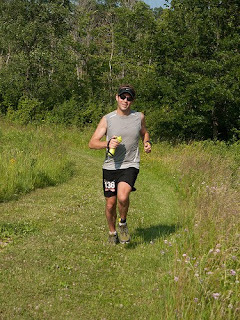 At this point in the race, the down hills really had torn up my quads. It hurt more to walk than run, so I simply just ran as much as could. I passed one more guy shortly after the aid station on the last really bad hill. He was struggling and I didn’t think he had the fuel to catch me in the end. Overall, I was happy to be up in the standings 11 spots. With the heat, I was happy with just coming in faster than last year’s time given the conditions. During: HEED refill topped with water every hour (dumped out each hour and started new if some mix was in there) 5 total – approx 30 oz water/heed mix every hour; GU (either Espresso Love or Vanilla Bean) every 40-45- total of 7 GUs, ½ cliff bar at 15.5 miles, 5 S Caps, and pretzels at 21.6 aid station. Total Time running – 4:47:16 (official race time was 4:49:58) difference due to “auto pause” set on Garmin during aid station stops. At the start of the race…..
At the half-way point – 2:14:20 on the clock! !